Hands down, the best way to get your blues chops up to snuff is to first learn all of the most popular blues standards and then play them as often as possible on the gig, at the jam, or with your buds. In Corey Congilio's Blues Guitar Fakebook: Rhythm, you’ll play through 30 rhythm guitar studies and learn the chords, rhythm patterns, fills, and comping approaches for the blues progressions and rhythm parts found in the most popular blues standards. Each rhythm guitar study is also charted with chord grids illustrating the exact chords that Corey plays throughout the study. 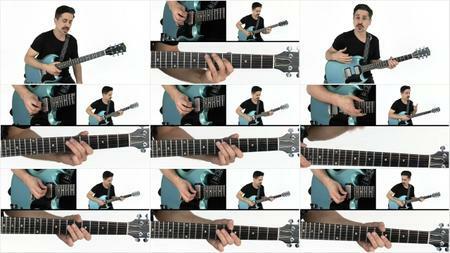 Reference the charts and play along with Corey to expand your chord vocabulary and develop your comping skills. You can also use the playalongs to practice improvising solos over these popular blues progressions. I'm Ready, Five Long Years, Born Under a Bad Sign, Messin' with the Kid, Sweet Home Chicago, King Bee, Crosscut Saw, Nobody Knows You When You’re Down and Out, Hoochie Coochie Man, Further On Up The Road, The Thrill Is Gone, Goin’ Down, I Got My Mojo Workin’, Key To The Highway, Tore Down, Sittin' on Top of the World, The Things I Used To Do, Good Morning Little Schoolgirl, She Caught The Katy, All Your Love, My Babe, Stormy Monday, Rock Me, Shake Your Money Maker, Killing Floor, Little Red Rooster, Everyday I Have The Blues, Evil, Hound Dog, Big Boss Man. All of the rhythm guitar performances are tabbed and notated for your practice, reference and study purposes. The charts include chord grids of the voicings Corey uses throughout the playalong. You’ll also get Guitar Pro files so that you can play, loop and/or slow down the tab and notation as you work through the material. Plus, Corey generously includes all of the rhythm tracks for you to work with on your own. 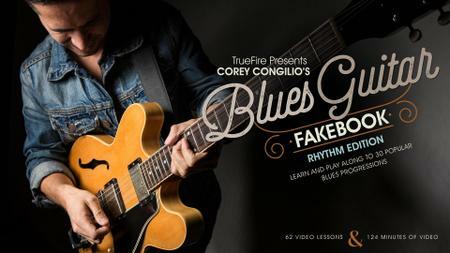 While the Rhythm Edition of the Blues Guitar Fake Book is designed primarily to help players improve their rhythm guitar and accompaniment skills, you’ll find each playalong — with Corey’s comping parts — to also be the perfect track to work on your solos and improvisation. Grab your guitar and let’s beef up our blues comping chops with Corey Congilio!